This article describes how the Single Sign-On (SSO) integration with Auth0 can be set up. 🔧 Auth0 SSO is achieved using the Custom SAML integration option in HappyFox. Using this integration, it's possible to have HappyFox agents and/or end users sign into the respective portals using the same email ID as configured in auth0. Creating an Application in Auth0 and configuring it with Callback URIs. Creating a SAML2 Web app add-on for your Auth0 application. 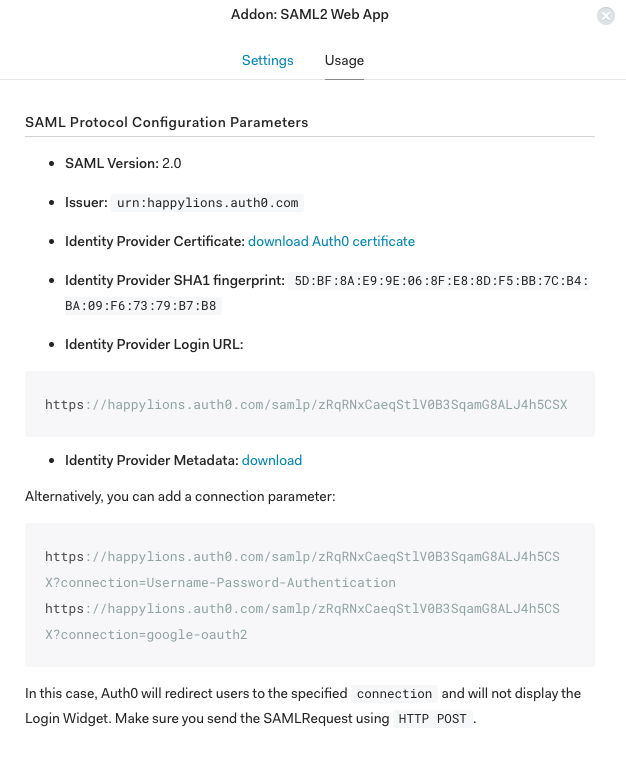 Installing the Custom SAML app inside HappyFox with the SSO target URL and IDP signature. Log in to Auth0 admin portal. Click "Applications" on the left navigation pane. Click "Create Application" to begin the process of creating an application. Give your application a name and set the application type as "Regular Web App". Click on Show Advanced Settings at the bottom of the page. Under the Certificates tab, copy the contents of the certificate from the Signing Certificate text area. This needs to be pasted in HappyFox later as IdP signature. Under the Endpoints tab, SAML section copy "SAML Protocol URL".This needs to be pasted in HappyFox as SSO target URL. Creating a SAML2 Web app add-on for the Auth0 application. Go to your Auth0 admin portal. Go to Application >> <Created Application>. Click on the "Add-ons" tab. Ensure that the application callback URL is https://<your account name>.happyfox.com/saml/callback/ This should be picked automatically in auth0. Log in to your HappyFox Agent portal. 🔐 You need "Manage apps settings" permission to configure this SSO. Go to Apps >> Single Sign-On >> Custom SAML method. Choose "Custom SAML method" under "Choose SSO provider". ✅ Please ensure "SAML Integration active" drop-down is set to active. The SSO target URL should be the URL copied from "SAML Protocol URL" inside Auth0 application advanced settings. The IDP signature should be the certificate content copied from "Signing Certificate" inside Auth0 applications advanced settings. Enable Authenticate helpdesk agent using SAML drop-down. Enable Authenticate end users using SAML drop-down. Click "Save Settings" to complete the SSO configuration. Once the configuration is done, Contacts can click on the Custom SAML button in the Support center login page to initiate the workflow. If Configured, Agents can also click on the Custom SAML button in their agent login page to do the same. 🌟 Tip: To Know how to configure Auth0 integration with HappyFox Classic, please refer to the document attached. Enable Onelogin SSO for your HappyFox account.